Adhuri Kahani Hamari is an 2015 upcoming show which will soon air on & Tv.4 Lions Film who earlier produced Humsafars,Iss Pyaar Ko Kya Naam Doon?,Humse Hai Life and Qubool Hai is producing this show.Laksh Lalwani and Mahima Makwana are playing the main leads in the show. Laksh Lalwani is playing the main lead in the show.He was last seen in MTV's Warrior High as Parth Malhotra. Mahima Makwana will be seen playing the female lead role.She was last seen in Sony Tv's Dil Ki Baatein Dil Hi Jaane as Disha. 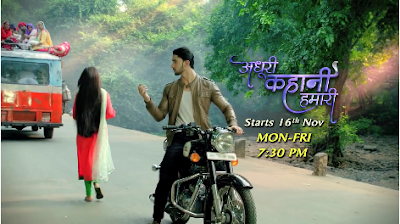 Adhuri Kahani Hamari will go on air from 16th November 2015 on & Tv at 7:30 pm time slot.The show will replace the ongoing serial Badii Devrani.